The East River isn't really a river, it's part of a tidal estuary separating Long Island from Manhattan Island and the mainland. At its north end the East River divides around what once were two islands, Randalls Island and Wards Island, joined into a single island in the early 1960s by landfill. 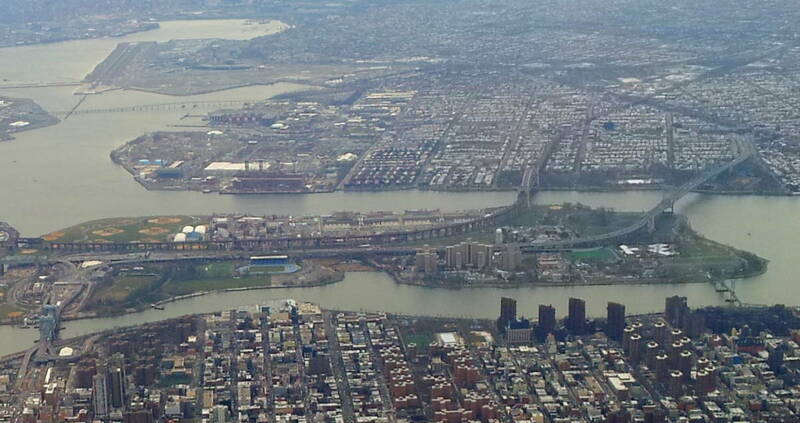 A body of water called the Harlem River continues to the northwest, dividing Manhattan from the Bronx. 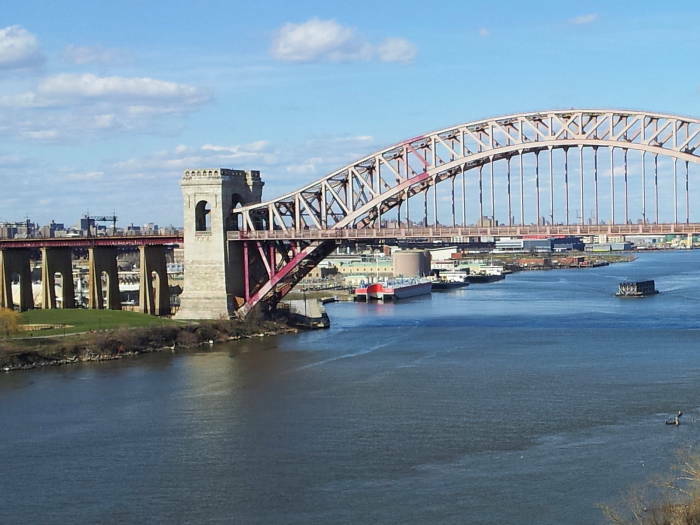 To the east, Hell Gate connects to the Long Island Sound between Long Island and the mainland of Connecticut. 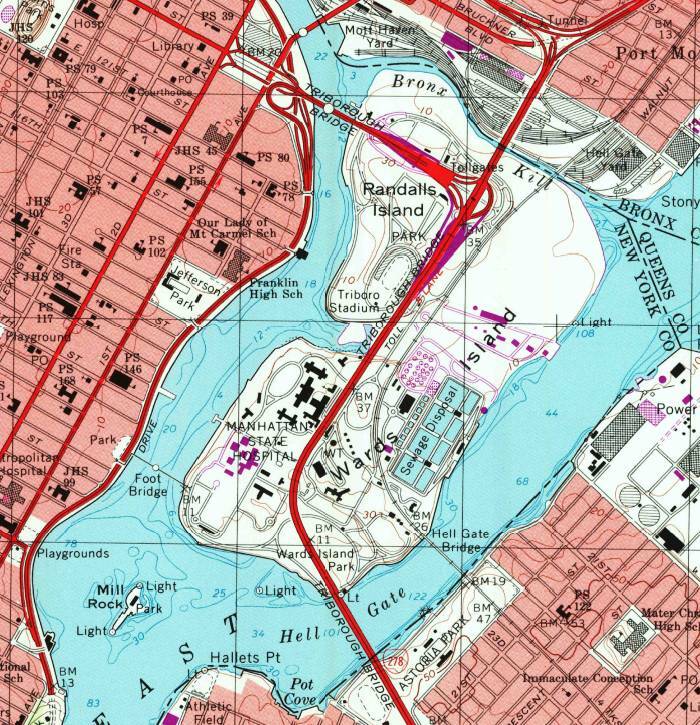 Randalls and Wards Island is surrounded by the East River, the Harlem River, Bronx Kill, and Hell Gate. The island is home to a large area of park land and athletic fields. It also has two psychiatric hospitals, a New York State Police station, the New York Fire Department academy, several homeless shelters, and the Wards Island Wastewater Treatment Plant. The islands went through a series of ownerships and names from the first European settlement through the early 1800s. In the mid 1800s a number of city and state social facilities were built on the islands — orphanages, poor houses, hospitals, reform schools, and what in 1899 became the largest psychiatric hospital in the world. 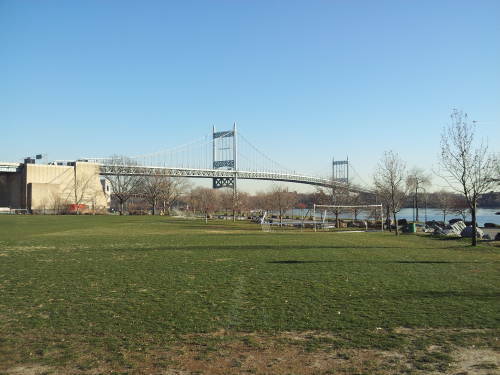 The Wards Island Bridge is a pedestrian bridge from 103rd Street in Manhattan to the southern end of the island. It was opened in 1951. Originally, it was only open during daylight hours from April through October. It was closed for repair in 2010-2012, and was kept open 24 hours a day after being reopened. 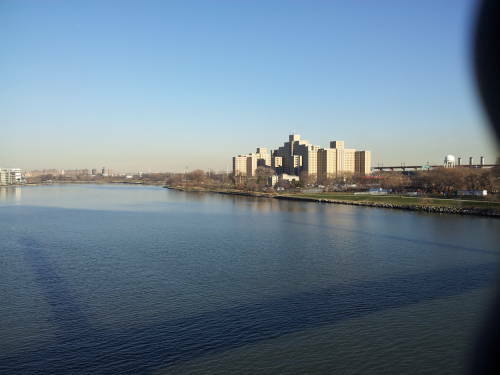 Residents of the East River Houses near the Manhattan end had been worried through the 1980s and 1990s about crime caused by patients crossing over from the Manhattan State Psychiatric Center. The hours were extended after the repair. Pedestrian bridge across the FDR Drive and the East River from Manhattan to Randalls and Wards Island. Manhattan State Hospital on Randalls Island. 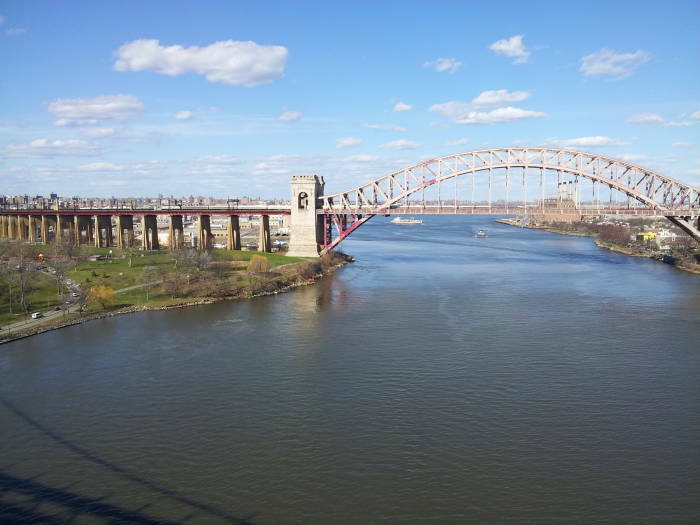 Robert F Kennedy Bridge crossing Hell Gate from Randall and Wards Island to Queens. 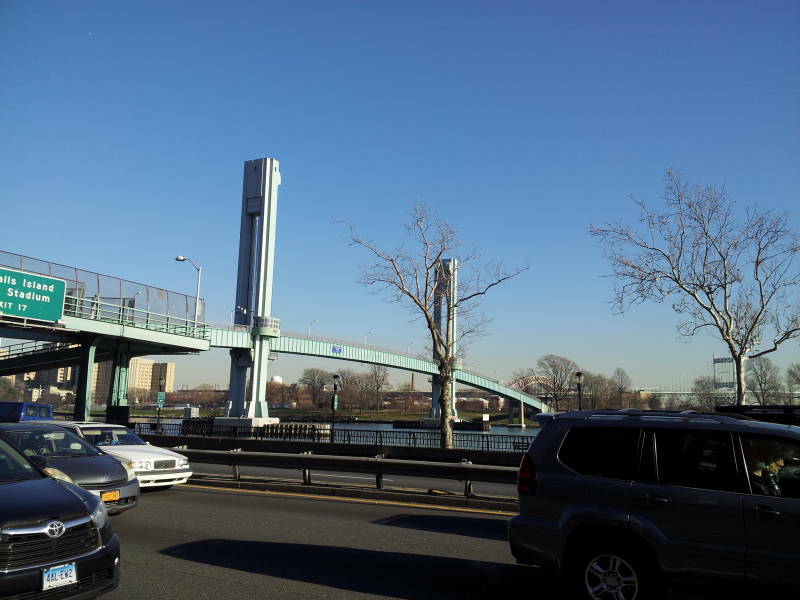 The Triborough Bridge, officially renamed the Robert F Kennedy Bridge, connects, yes, three boroughs: Manhattan, Bronx, and Queens. 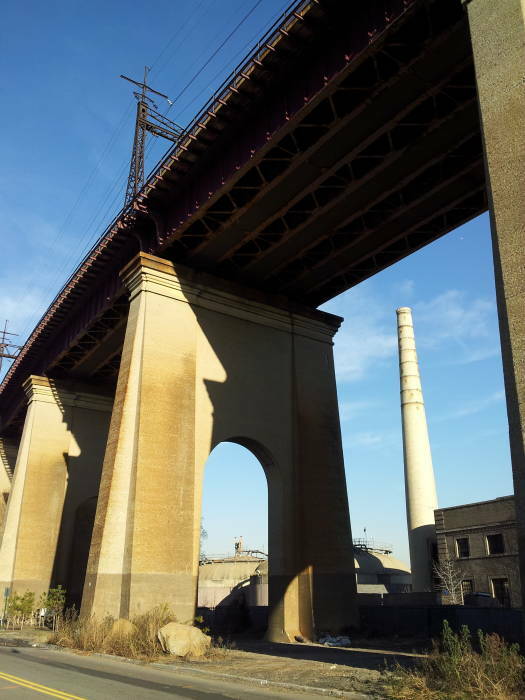 Its components cross Randalls and Wards Island on elevated viaducts. Construction started on Black Friday, 25 October 1929. By early 1932 graft and the Great Depression had brought construction to a halt. Construction restarted in November 1933 with support from the Public Works Administration. It was the largest PWA project in the eastern U.S., and one of the largest public works projects of the Great Depression. It was dedicated in July, 1936. Tolls are now $8.00 per car, $3.25 per motorcycle. 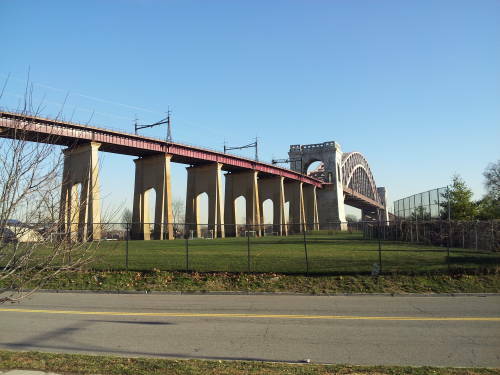 The Hell Gate Bridge is another impressive bridge crossing Randalls and Wards Island. This is a railway bridge. It was designed in the early 1900s to link the Pennsylvania Railroad with the New Haven Railroad. It now carries Amtrak trains between New York's Pennsylvania Station and stations in Connecticut, Rhode Island, Massachusetts, Vermont, and Maine. It was built from March 1912 through September 1916. Washington-Boston trains began running across it at the beginning of April in 1917. 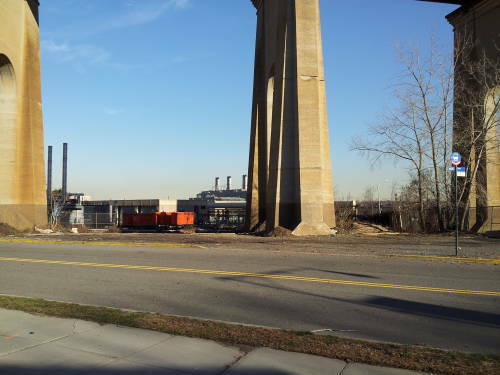 The bridge is now owned by Amtrak and carries its Northeast Corridor main line. The passenger tracks are electrified, 12.5 kV at 60 Hz. The bridge also serves as the only freight rail connection between Long Island and the mainland. The Wards Island Wastewater Treatment Plant is visible beyond the Hell Gate railway bridge from the Triborough Bridge. One of Amtrak's Northeast Corridor Regional trains from New York to Boston crosses the Hell Gate railway bridge. Hell Gate railway bridge crossing from Randall and Wards Island to Queens. 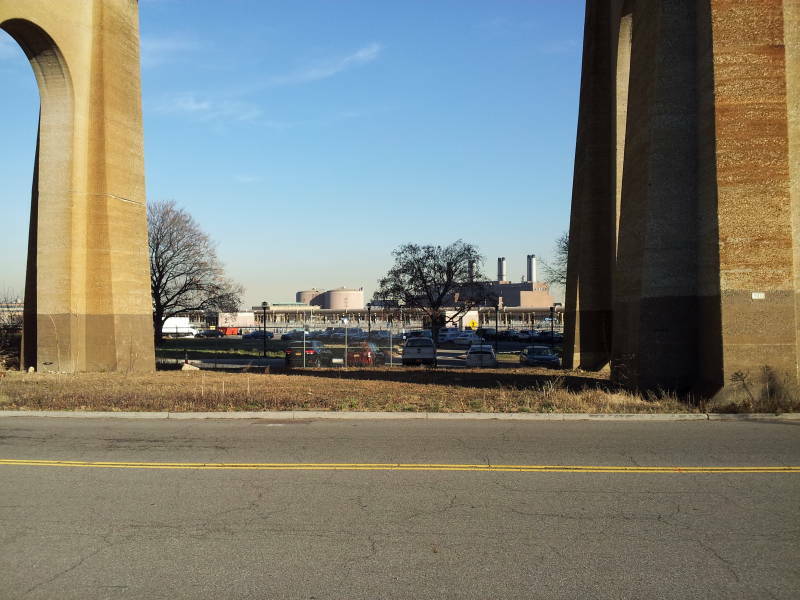 Wards Island Wastewater Treatment Plant seen underneath the Hell Gate railway bridge. 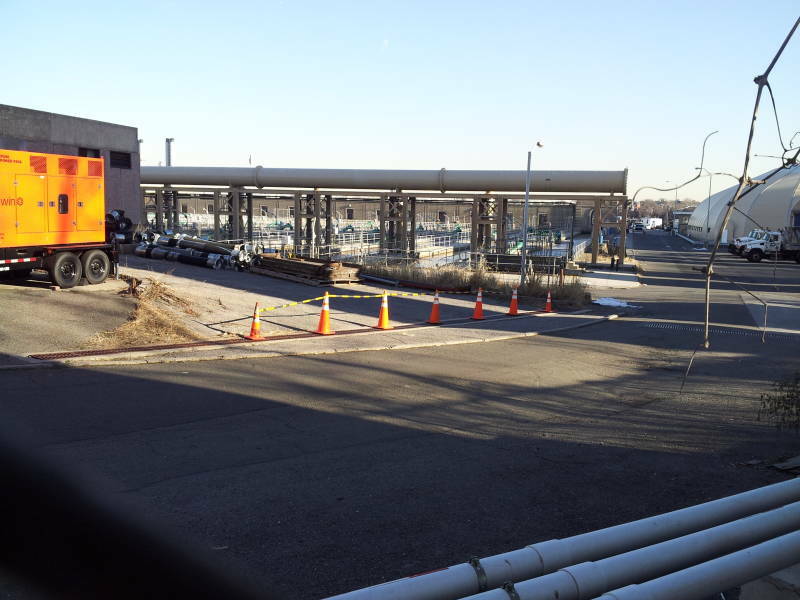 Wards Island Wastewater Treatment Plant is one of the larger of New York City's 14 wastewater treatment plants. The plant opened in 1937, just a year after the Triborough Bridge. The conclusion of The French Connection takes place in some old industrial buildings on Wards Island. The Wards Island plant serves a population of just over one million people in western Bronx and the Upper East Side of Manhattan, an area of 48.7 square kilometers. The plant can handle just over one million cubic meters of sewage inflow each day. It also does dewatering, one of the final stages of sludge treatment, for other plants including the North River plant. This reduces sludge to biosolids, a material similar to soil and used for fertilizer. New York started building a sewer system in the mid 1800s. The Croton Aqueduct had opened in 1842, and it was bringing clean drinking water into the city. The citizens could now use more water, and that water was much cleaner. But now they were taking much less water out of wells and cisterns. This made the water table rise, and cellars began to flood. The city started building sewers. The sewer construction started in the tenement areas where cellar flooding was worse. Just ten years after the Croton Aqueduct began operation, in 1852, there were 238 kilometers of sewers. Sedimentation tanks and associated electrical power plant. 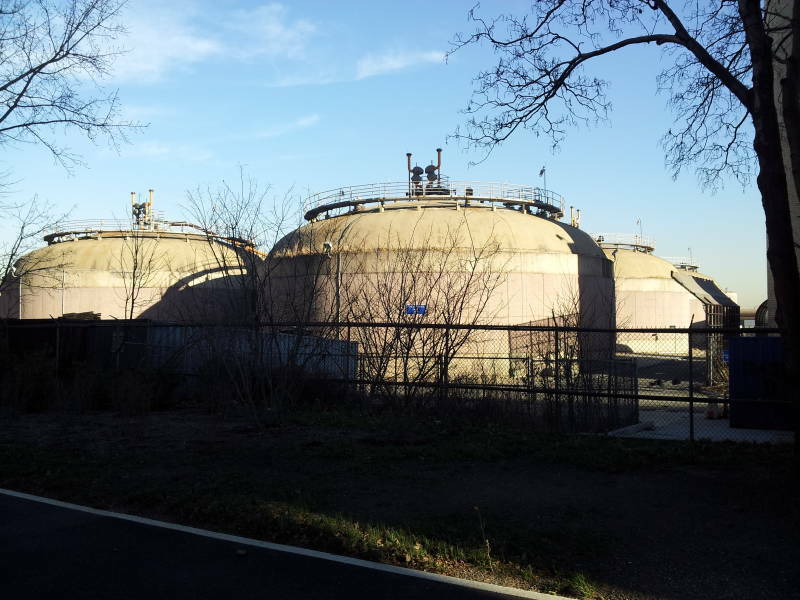 Anaerobic digestion tanks for sludge treatment.